Learn how to schedule payments in Online Bill Pay in QuickBooks Online. Are you wondering what the timing is when you pay a bill in Online Bill Pay? Don't worry. In this article, we'll tell you everything you need to know. Here's what you need to know about paying a bill. Enter details on the bill and schedule a payment. 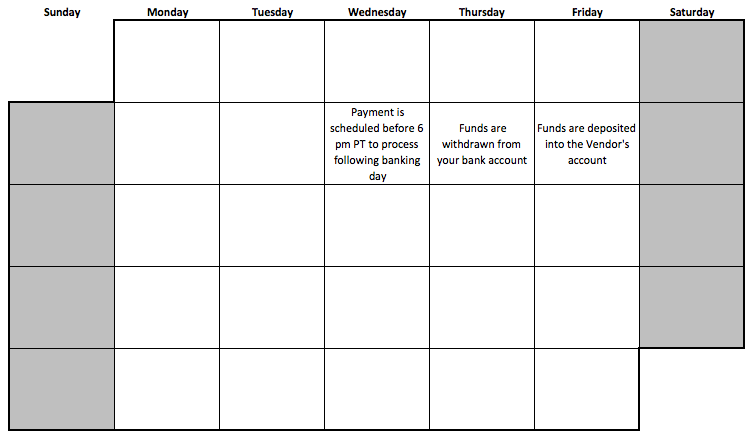 (Schedule a payment by 6 pm PST, and we'll start working on it the next banking day). We show you an expected arrival date for each payment. 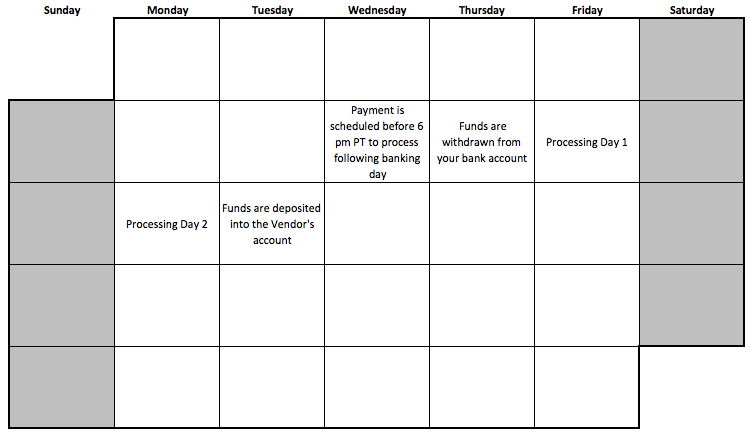 Allow four banking days for the payment to be received by the vendor. Check payments may take longer than four banking days to reach the vendor. Banking days are Monday through Friday (excluding federal holidays). The Pay Bills Online page will always show an "Arrives by" date for Bank Transfers. And "Est. arrival" date for paper checks. Note: Check arrival dates for non-expedited payments are always shown as estimates, since we cannot guarantee USPS delivery times. What you need to know about holidays and limits. The earliest process date you can select is the next banking day. (You can't select the current date.) Weekends and holidays don't count. If the day you select is a federal holiday or weekend day, we will push the process date to the next available banking day. 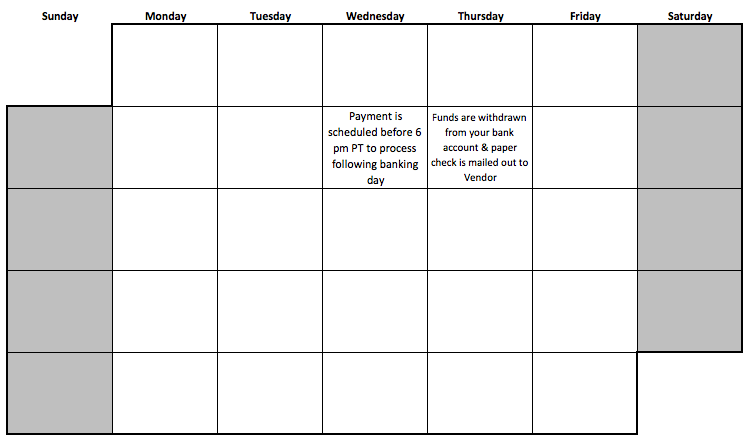 Example: If you attempt to schedule a payment on Thanksgiving Day (Thursday), we will automatically make the process day Friday, which is not a federal holiday. If a weekend or federal holiday falls within the regular processing time for a payment, the payment will be delayed. That delay will be reflected in the "Arrives By" date. There is a per payment threshold that is activated for payments over $5,000, which will initiate a slower payment timing. This allows Bill.com to ensure the funds are available prior to sending the payment to the vendor. 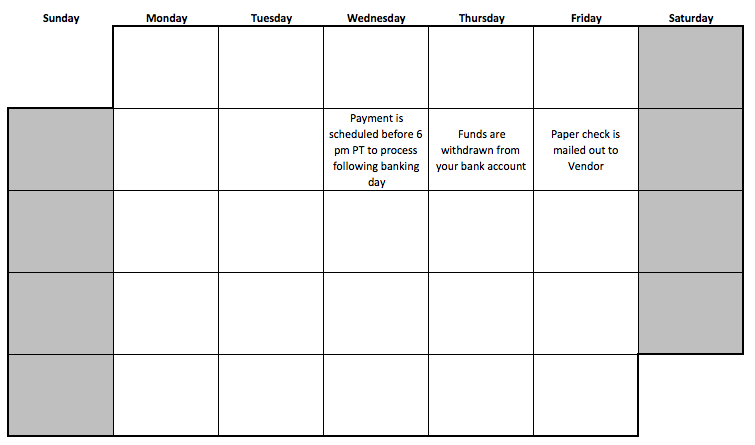 Here are examples of bank transfer and paper check payment schedules.